This LCD display delivers vivid colors with high-contrast and sharpness. Featuring an all-new electrostatic capacitive touch panel and High Definition LCD Panel, with high luminance white LED backlight. High-Resolution Audio is high-quality sound that exceeds CD standard. High-resolution audio captures and beautifully expresses all the details of your favorite music. Through ultra-high and low frequencies, immerse yourself in a rich and high-quality sonic experience. * The product with this logo is conformed to High-Resolution Audio standard defined by Japan Audio Society. This logo is used under license from Japan Audio Society. To ensure the best possible sound quality, the receivers use custom-made and carefully selected parts,such as audio quality power supply capacitors, high quality coupling capacitors and cross-shaped panel structures*. These parts are further optimized through meticulous tuning of the component values and circuit paths. Compatible with a broad range of audio file formats from high-resolution audio sources such as FLAC and WAV, to MP3, WMA and AAC. Also plays DSD (Direct Stream Digital) format les with a broader reproduction frequency band for life-like high-resolution sound reproduction. DSD playback up to 11.2 MHz ensures the very highest sound quality, with both the outstanding clarity of digital sound, coupled with the characteristic smoothness of analog sound sources. Weblink - Your Portal to Youtube, Yelp and more. Android Auto was designed with safety in mind, helping you to minimize distractions and stay focused on the road. And now you can connect wirelessly, so you can enjoy all of your smartphone’s features without the fuss of any cables. KENWOOD’s multimedia receivers combine Android Auto’s intuitive voice controlled interface, a large touch screen and superior sound quality. Making it the perfect complement for your in-car life. *Android Auto may not be available on all devices and may not be available in all countries or regions. For details about Android Auto, visit https://www.android.com/auto/ and https://support.google.com/androidauto. 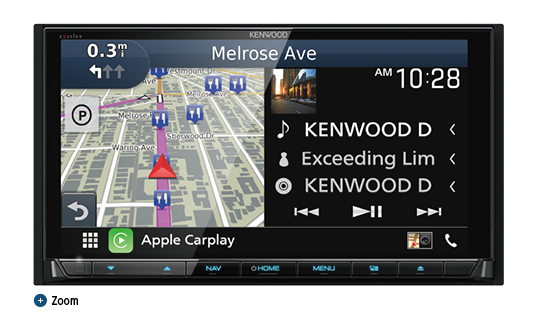 CarPlay is the smarter and safer in-vehicle interface to operate your iPhone, and the experience is taken to another level when featured in a KENWOOD multimedia receiver. Simply talk to Siri, or touch the receiver’s display and get directions from Apple Maps, make phone calls, listen to voicemail, send and receive texts, and listen to music all in a way that allows you to stay focused on the road. Up to 5 Bluetooth® devices can be connected to the head unit at the same time and you can enjoy audio streaming just by switching the devices with your friends or family. 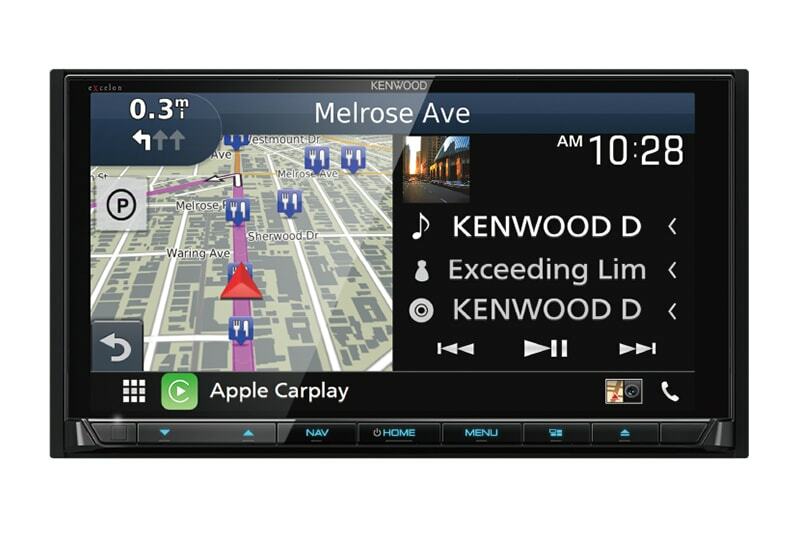 Equipped with the industry standard Garmin navigation system, offering a variety of display options like “Junction View with Lane Assist,” “3D Building Map,” “Intelligent Parking Assist,” and “Traffic Information”* to make your driving easy. Full HD video recording is available in a compact windshield mount that can record every event in front of you while you drive. High Dynamic Range (HDR) allows awless recording regardless of extreme bright light or very dark conditions. With a built-in gyro sensor, if an accident occurs it will be saved in a separate portion of memory within the 8GB SD card for viewing. Additional safety and warning features can be activated to avoid frontal collisions or remind you if traffic c has moved in front of you. Garmin Photo Real Junction View shows what complex interchanges look like before you arrive.